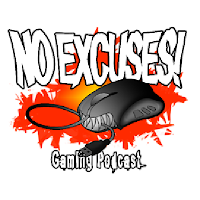 The Roaming Rig is still bricked so until such time it is repaired or replaced No Excuses will be a podcast only show. This should only be the case for a week or two until everything gets sorted out. We'll keep you all posted as soon as we know when we can return to normal. In the meantime, Here's some podcasts! This week:Boom! The Roaming Rig dies a horrible death and leaves the show off air, but we're still here with a non-live episode while things get sorted out. Valve backpeddles on their ill-advised mod sales the the relief of all, but implement a tool allowing developers to ban people from their games. Some ex-Rare guys start a kickstarter for a game that is totally not Banjo Kazooie and gets showered in money and Silent Hills vanishes into the fog. This week:Terrible Ideas! Valve and Bethesda set up paid mods through stream and open the floodgates of internet rage! Is the concept completely ridiculous or is there a good idea in there somewhere? Also excessive man flesh, zailing the zeven zees and feet without ankles. Don't forget to email the show at noexcusesvtw@gmail.com!